The Smoke Hollow 30162E Electric Smoker which is ideally for smoking outdoors is bundled with flexible features for smoking a variety of dishes. You can adjust its temperature with the temperature adjustment levels. For easy transport and handling, the unit also comes with a detachable controller with a 5-inch cord. The wood chip box is crafted from high temperature painted steel and the water pan with porcelain-coated steel to prevent further corrosion and rusting. Leaks are prevented with the door’s magnetic latching system. For easy monitoring, the unit comes with a temperature gauge which gives off accurate temperature readings. It is a indeed a piece composed of heavy duty and good quality materials. 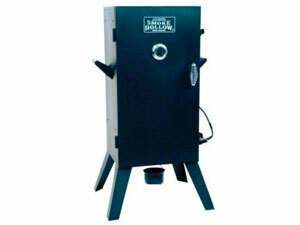 The temperature gauge that goes with the smoker simply provides accurate reading of the temperature. Regardless of how high or low is the outside temperature, the smoker can maintain its heat with the double steels wall and insulation. Once you purchase the whole unit, you will appreciate how the whole thing was packed and shipped. Everything seems so fantastic. The smoker has proved its strength and good quality through frequent use for almost two years now considering that it is used in different environmental temperatures and weather. The plating of both the wood chip box and water pan were rust free. When talking about smoking different kinds of dishes, you can expect a flavorful and evenly smoked food with great tenderness. While doing smoking jobs, it was observed that smoke just easily gets off the unit which results to reduced smoke. You cannot get the desired temperature and smoke that you wish to attain for your dish. Tendency is, your food lacks the smoke taste and requires a longer period of time to have your food fully smoked. In addition is the temperature control which in some instances does not work just right. No matter how much you increase the heat, still there are no changes with the heat temperature as indicated in the built-in gauge.